I've been away from the Superromance blog for far too long. It's good to be back. Recently, I attended a baby shower. Does anyone else have the same trouble with showers, any kind, that I do? Why is it so hard for a shower to become a truly fun social event? I drove a carful of women to this shower and, on the way, we all wondered why it was that you could bring a bunch of strangers together for a party and they will eventually end up having a great time, but not at a shower. The obvious answer, of course, is that there are few parties where alcohol doesn't ease inhibitions. There wasn't a drop of alcohol served, just loads of excellent coffee and a variety of delicious pancakes and some baked beans. The people came from very different, unrelated social sources—some from the cycling community of my city and some from the swing dance community. The two factions had never met before, but we had a real blast. It was so much fun. There was an age range from early twenties to early sixties, too, but that didn't seem to hold anyone back. It was a truly successful brunch...without alcohol. Why then is it so hard to have fun at a shower? We attempt to break the ice, we talk to those sitting beside us, those who know each other well might share some laughs, but we never become a cohesive whole. In other words, we try, but we never seem to really have fun, despite the games designed to loosen everyone up. The young woman who was pregnant received a LOT of gifts, so it took forever for her to open them. By the time the shower ended, I could tell people were ready to leave. One absolutely wonderful idea, though, redeemed the shower from being only a duty or chore. The organizers had asked that, rather than putting a gift card on each gift, we should add a book, perhaps our favourite book from childhood, or a current children's book we liked. That generated conversation more than any of our earnest individual attempts to break the ice with those around us. By the end of the shower, the baby had an excellent library! Such a truly wonderful idea. 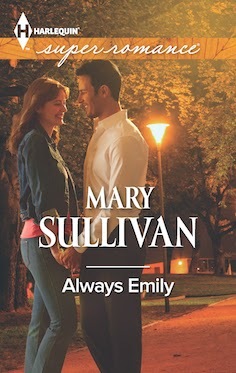 I would like to give away a copy of my May Superromance, ALWAYS EMILY, to anyone who answers this question today: what was your favourite book when you were a child? I will announce the winner on the weekend. Mine was about a ballerina. I remember how I imitated all of the foot positions in the book. I also owned a 45 that I listened to constantly. On any given day, you could see me twirling about the living room pretending to be a ballerina. Rapunzel -- and i used to wrap a towel or a bedsheet (even better) around my head for pretend hair. That book idea is fantastic. I really don’t enjoy most organised events… No matter what the occasion, there seem to be more and more organised activities included these days. It makes you feel like you’re back in kindergarten! But they’re just the first two off the top of my head. I feel guilty picking one book over all others! Oh, and those books about little girls doing ballet? I had a million of them! In the years I taught ballet, every new term - without fail - I'd be yelling trying to stop the new girls shoving their feet and legs into the positions they'd seen on TV! There were toes in one direction and knees in the other, and as someone who has dislocated their knee a dozen times, I was on the verge of a breakdown, watching them! Including a book - what a wonderful idea for a baby shower! When my daughter was born (and after the relief accompanying the news she was fine), I soon thought about all the fun I had to look forward to in sharing my favorite books with her. I had different favorite books at different times in my childhood. The first favorite I can remember is Beatrix Potter's 'The Tale of Two Bad Mice' as I longed for a dollhouse and loved Potter's illustrations. As I grew older, I spent many happy hours absorbed in the 'Little House' books by Laura Ingalls Wilder and again, the illustrations (by Garth Williams,) helped pull me into the story. On the ballet theme, 'Ballet Shoes' by Noel Streatfeild was also a favorite. See...too many books to pick just one! Thanks so much for your post which helped me take a trip down memory lane. Oh wow... what a wonderful idea about the books! The first one that I remember really getting my attention as a kid was Winnie The Pooh by A.A. Milne. LOL, Marelou. I can just see you running around with your pretend hair. Very sweet image. Sonya, there are so many amazing books in the world, current and classics, that it is truly hard to choose favourites. How wonderful that you taught ballet! I would have to say The Boxcar children by Gertrude Chandler Warner in 1942. I loved that book. I still have it and my 2 girls read it too. Jen, I'm the same. One of my favourite things to do with my daughter when she was young was reading to her. Loved it! You had a great selection of children's books! Colleen, Winnie the Pooh is a classic for a reason. Such wonderful reading! Little Women by Louisa May Alcott was my favorite book when I was a child. I hate naming favorites as I love so many different books. I do remember Pokey Little Puppy, The Little Engine That Could, and a lot more of the Golden Books. Some of them are not politically correct anymore like Little Black Sambo. I found that one so interesting as I liked butter. My favorite was HEIDI by Johanna Spyri. I loved that story. I could totally picture myself helping Grandfather tend to the goats up in the Alps. I must say that I did picture myself looking like Shirley Temple did in the movie version. All perfect dimples & ringlets. I don't remember my toddler books (I got my first library card in Kindergarten), but I DO remember enjoying the NODDY books by Enid Blyton. My parents bought me RAGGEDY ANN AND ANDY books not long afterward (receiving two new books each month) and then I progressed to THE HARDY BOYS by Franklin W. Dixon. When I couldn't find anymore of those, I read NANCY DREW by Carolyn Keene (but I preferred the boys).